Furnish your classroom or library in style with the MG Series Activity Table and Chair Set. The MG1101 Stack Chair features a one-piece polypropylene shell that's contoured for lumbar support. It’s firmly attached to an 18-gauge steel frame with hidden rivets and welded brackets. Self-leveling glides prevent wobbling and protect your floors from scratches. The 12" seat height is recommended for preschool or kindergarten students. 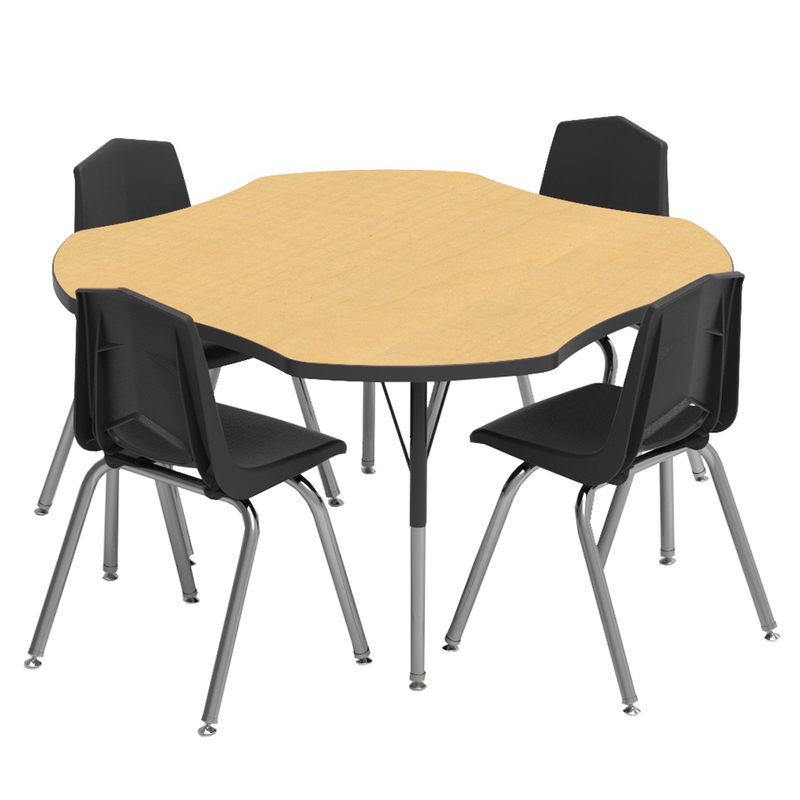 The MG2200 Series Clover Activity Table stands up to years of daily classroom use. Powder coated steel legs adjust from 16” – 24” in 1" increments. The tabletop is constructed of particleboard with a thermo-fused melamine finish. PVC edge banding protects the perimeter from wear while eliminating gaps for germs and dirt to gather. MG Series Activity Table and Chair sets are available in several color combinations and come backed by a 10-year warranty. The grade level listed is a suggestion; measuring is the ideal way to find the best seat height. Simply measure the distance from the floor to the back of the child's knee (where it bends). If the measurement is between two seat sizes, round down to the smaller seat height. Table height adjusts from 16" - 24"
Furnish your classroom or library in style with the MG Series Activity Table and Chair Set. The MG1101 Stack Chair features a one-piece polypropylene shell that's contoured for lumbar support. It’s firmly attached to an 18-gauge steel frame with hidden rivets and welded brackets. Self-leveling glides prevent wobbling and protect your floors from scratches. The 14" seat height is recommended for kindergarten through third grade. The MG2200 Series Clover Activity Table stands up to years of daily classroom use. Powder coated steel legs adjust from 21” – 30” in 1" increments. The tabletop is constructed of particleboard with a thermo-fused melamine finish. PVC edge banding protects the perimeter from wear while eliminating gaps for germs and dirt to gather. MG Series Activity Table and Chair sets are available in several color combinations and come backed by a 10-year warranty. Table height adjusts from 21" - 30"
Furnish your classroom or library in style with the MG Series Activity Table and Chair Set. The MG1101 Stack Chair features a one-piece polypropylene shell that's contoured for lumbar support. It’s firmly attached to an 18-gauge steel frame with hidden rivets and welded brackets. Self-leveling glides prevent wobbling and protect your floors from scratches. The 16" seat height is recommended for fourth through sixth grade. The MG2200 Series Clover Activity Table stands up to years of daily classroom use. Powder coated steel legs adjust from 21” – 30” in 1" increments. The tabletop is constructed of particleboard with a thermo-fused melamine finish. PVC edge banding protects the perimeter from wear while eliminating gaps for germs and dirt to gather. MG Series Activity Table and Chair sets are available in several color combinations and come backed by a 10-year warranty. Furnish your classroom or library in style with the MG Series Activity Table and Chair Set. The MG1101 Stack Chair features a one-piece polypropylene shell that's contoured for lumbar support. It’s firmly attached to an 18-gauge steel frame with hidden rivets and welded brackets. Self-leveling glides prevent wobbling and protect your floors from scratches. The 18" seat height is recommended for middle and high school. The MG2200 Series Clover Activity Table stands up to years of daily classroom use. Powder coated steel legs adjust from 21” – 30” in 1" increments. The tabletop is constructed of particleboard with a thermo-fused melamine finish. PVC edge banding protects the perimeter from wear while eliminating gaps for germs and dirt to gather. MG Series Activity Table and Chair sets are available in several color combinations and come backed by a 10-year warranty. Furnish your classroom or library in style with the MG Series Activity Table and Chair Set. The MG1101 Stack Chair features a one-piece polypropylene shell that's contoured for lumbar support. It’s firmly attached to an 18-gauge steel frame with hidden rivets and welded brackets. Self-leveling glides prevent wobbling and protect your floors from scratches. The MG2200 Series Clover Activity Table stands up to years of daily classroom use. Adjust the powder coated steel legs in 1" increments. The tabletop is constructed of particleboard with a thermo-fused melamine finish. PVC edge banding protects the perimeter from wear while eliminating gaps for germs and dirt to gather. MG Series Activity Table and Chair sets are available in several sizes and colors. Call our friendly customer service team at (877) 839-3330. They'll be happy to assist you with a quote or order.